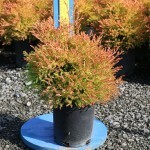 A slow growing, dense shrub. New growth appears red while the interior maintains a green-gold color. 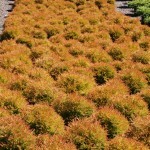 This sport of Thuja 'Rheingold' was introduced by The Conard-Pyle/Star ® Roses. It requires little to no pruning to maintain its neat form. Easily grown in full sun to part shade. 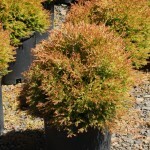 It is somewhat tolerant of a range of soils, but prefers a moist, well-drained site. It is intolerant of dry conditons. PP 19,009.